Do you like art museums? Are you intimidated by the idea of taking your kids to an art museum? Don't be. Art museums are for all ages and there are many art museums that are free, have free days, or pay-what-you-wish times. Many have a wide variety of art, so you may find pieces you love and pieces you detest in the same building. That's part of the fun! Pick your favorites and least favorites. We have 2 amazing art museums in Baltimore that are free! 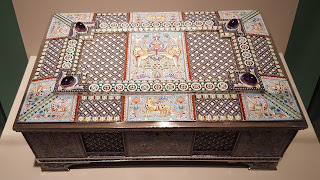 The Walters Art Museum has a wonderful collection of ancient art, as well as European, Renaissance, Asian, and more. If you have kids that find ancient Egypt interesting, they will enjoy this museum. It has a variety of rooms and displays, so explore the various floors. They even have magnifying glasses for kids to use in some of the rooms to look at jewelry and smaller items.